My long association with The Raj Company has been nothing but a pleasure. Many years ago, during my first visit to Bombay a whole new world opened up to through Ricky Lamba. His fantastic collection of Anglo Indian and Portuguese colonial furniture serves as a wonderful starting off point for beautifully made reproductions, made for modern times. Through the Raj Company we have been able to supply our clients with specifically scaled, beautifully made and durable reproduction furniture that has the quality of the originals. Further , the Raj Company has made several container loads of wonderful "western style" case good and occasional furniture in teak and other woods for Tom Scheerer Inc, all with the same attention to detail and quality. Bravo Ricky! May you outlive me so I don't have to do without you! 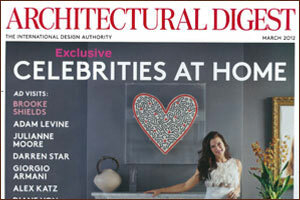 I was introduced to Ricky Lamba by my dear friend and fellow Interior Designer Tom Scheerer. Tom is a genius at his métier. Tom found Ricky on the internet and made the journey to Mumbai to see him. There he discovered Ricky's magical enterprise which uses artisans to create hand carved furniture with centuries-old techniques. We all got a glimpse of these pieces as they began year by year to bring wonder at the Lyford Cay Club during Tom's decade long transformation/freshening of this Colonial gem in the Bahamas. Ricky's interpretations of seriously classical pieces for the Main Club as well as whimsical pagoda shaped cabana furniture for the pool captured our imagination. What we learned from Tom is that Ricky reveled in the challenge. Ricky's own encyclopedic knowledge of classical furniture and scale made this collaboration wondrous for Tom and Ricky. 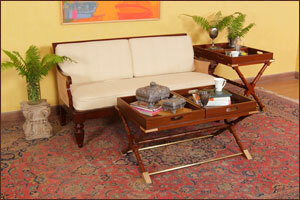 Ricky started to collect Indian antique furniture as a young boy. 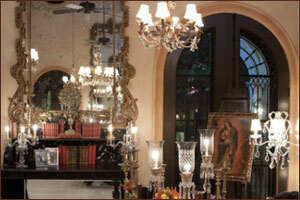 He currently has the largest collection of Antique furniture in india. A young obsession turned into a masterful life of collecting and creating. In my own design business we cannot do a project without these very special pieces from Ricky. They resemble nothing else. They are truly hand carved and created and finished. They are special. Ricky guides and designs and advises daily on projects. His knowledge and ability is world class. I have worked with Ricky for years and visited his remarkable factory in Bombay ....... His furniture is not only perfect for projects in the tropics - where I have decorated entire houses with his pieces ......they also work in cities . In fact I'm wracking my brain to think of somewhere I haven't included something of his . He is extremely collaborative , enthusiastic and intelligent ....... in fact I'd like to be Ricky when I grow up. Ricky and I were introduced by an American hall of fame decorator type who had used his workrooms to produce some of the most charming Anglo-Indian furnishings that I have seen to date…really the Ceylonese never had it so good. A scholar, gentleman and a master of all he pursues, Ricky is the best. where one can also see other pieces we have collaborated on: a set of Jacob Frères inspired bergere and a large set of Chippendale dining chairs, both executed in teak and upholstered in Sunbrella, divine for the terrace in any chic seaside setting, yet also perfectly at home in a glamorous Manhattan loft. Towering faux bamboo etageres in the Chinese Export taste house my rare book collection nearby and are also of our collaboration. I look forward to our next production, which will likely be any day now. 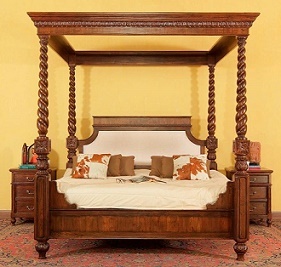 If considering production of Anglo-Indian, Burmese Colonial, Anglo – Ceylonese furniture for either a house or a chic luxury hotel, there is no short list of carvers and cabinet makers from which to choose from..…there is just Ricky Lamba & The Raj Furniture Company. I can be reached by email or telephone for verification of anything written here. 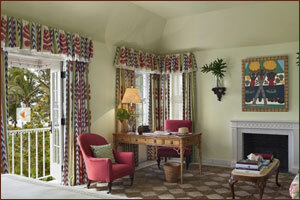 An exciting project in Mexico called for the in depth expertise of an 18th C Artisan. 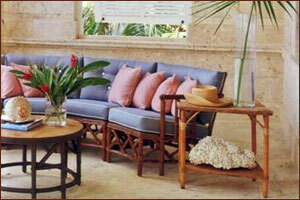 The Mexican east coast steeped in architecture did not replicate such fine antiqued pieces on the scale needed. Already a trusted friend of my clients, to look half way across the globe to Ricky's Mumbai emporium replicating pieces rich in Portuguese heritage was an easy segeway, we were able to fit out a 20,000 sq.ft. project with all of the nuances needed to compliment our architecture, on time and with toe curling beauty. Now, not only a respected colleague but a true friend, a recommendation is hardly needed, he is indeed a treasure that maybe I shouldn't share!! By sheer chance, several years ago while visiting Mumbai, my husband and I stepped into Ricky Lamba’s fabulous emporium. 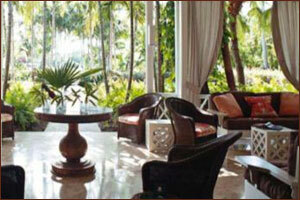 We were just in the planning stages of our hacienda on Mexico’s Caribbean Coast. We knew exactly what we wanted, but hadn’t yet begun. As we walked through room after room of glorious antiques and exquisite reproductions, redolent of craftsmanship, each piece with its own soul, we were completely astonished. My husband immediately proceeded to buy ten antique carved South Indian beds, as well as many other fine antique and reproduction pieces. Our good friend and most excellent interior designer, June Scott of DWG Design Studio, worked closely with Ricky Lamba over the next year to create all of the furniture to compliment her extraordinary design work on our hacienda in the Yucatan. The house and the furniture were ready on time and, shortly thereafter, the entire project had the desired feel of having been there for a hundred years. I thank my good friend Ricky Lamba and I would always hope to work closely with Ricky and June on any projects we might embark upon in the future. Working with Ricky Lamba and The Raj Company has been a complete pleasure. Their style, quality and attention to detail is unmatched anywhere. Whether we're working on a house in the Bahamas or a thoroughbred farm in Kentucky, they always find the perfect way to make our vision come to life. 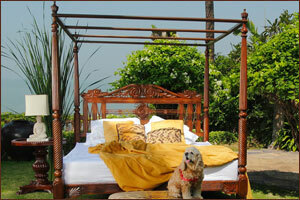 I first heard of The Raj Company when I was looking for a four poster bed for a client in New York City. From conception to completion and delivery the entire journey was a pleasure. Ricky was extremely helpful, professional and prompt. When the bed was delivered my clients were positively delighted. 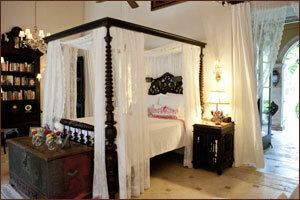 The colonial four poster bed fits well in the chic lower Manhattan large bedroom with high ceilings. I am looking forward to visiting Mumbai later this year. There is so much more I want to create with The Raj Company! We would like to thank you for the excellent service we received from The Raj Company. From our initial meeting in December 2015 through to the receipt of our pieces in March this year, you have demonstrated utmost professionalism, technical expertise, respect and integrity. We especially appreciated the fact that, after our initial discussions, you were able to produce exactly what we requested while including some updates that would enhance both the design and the practical use. 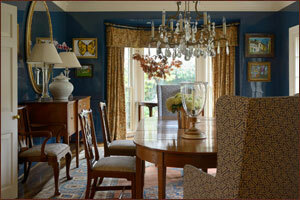 The quality of your craftsmanship is excellent and pieces look stunning in our home. Through the whole process you kept us informed with regular updates and, perhaps most importantly, you were able to keep your word and deliver everything on time. As you know, we hosted my daughter's wedding at the end of March and so keeping to our agreed timeline was particularly important to us. Thank you, again, for one of the most pleasant vendor experiences we have ever had. The three new tables are now installed and look very at home. They are really fantastic, full of character and I'm very pleased with them. Also, the custom dimensions of the butlers table are just right and it's fits perfectly! So thank you and I look forward to ordering some more stuff soon.